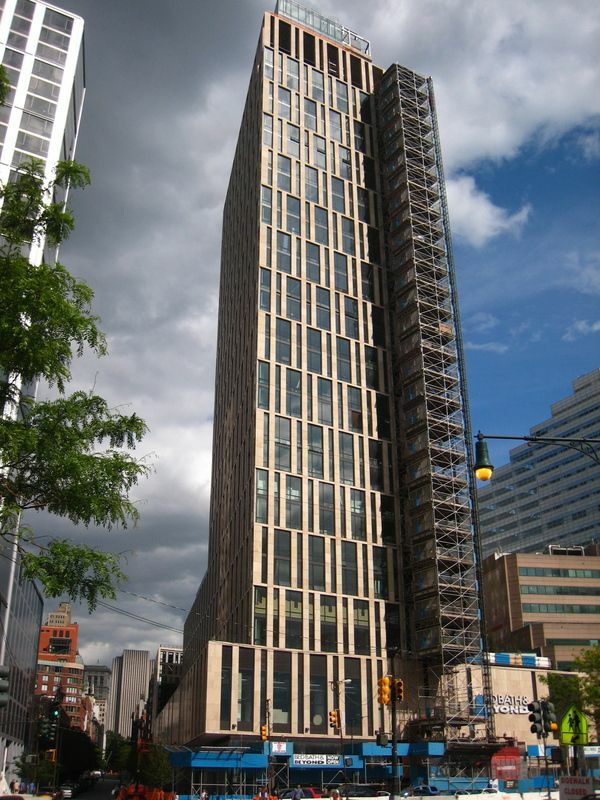 Thread: Toren - 150 Myrtle Avenue @ Flatbush Ave - Condo - by S.O.M. I think this one has earned its own thread. They were jumping the crane today - quite the event. It looks as if there are about 5 floors left to go and then she tops out. The skin is creeping up the tower as well - about 3 floors or so all around. Interstingly Cats has started clearing the site next door where the tower would go in his multi-building complex. I know that he has said that there are no immediate plans to start work on the tower, but still piqued my interest that he would spend money clearing that site at this point w/o any apparent use for it. He's up to something. Skin looks fabulous. I didn't bother taking any photos b/c tarps are covering most of it for protection. Avalon across the street is the only project I have a problem with. It's the designs I've seen I think it will smother Toren, which has a rather interesting. This place is off the meat rack. Where do I sign up for 4 more? Thanks, Hrair. Welcome to the forum! i doubt this is going to look anything like the render. in the installed facade, its boring tan color and reflective windows. I'm reserving judgment. It seems too soon to ge a handle on what the facade will look like or the effect that the base will have on the overall tower. FYI - I think 101 Warren ended up being rather nice. She's a beaut. Thanks for the pics. Walking by today, it appeared as if this baby's topping out. The facade is really coming along, love it.